The Strange Undersea Creatures Worksheet – Get our educational fun and interesting FREE printable science worksheets for kids to download. This worksheet all about strange ocean creatures includes a fun search a word puzzle as well as a find-the-missing hidden words game for children. Our science worksheet is free to print and use as often as you need. The free to download worksheet for kids is suitable for Grammar school kids in Grades One to Five as well as for kids in Kindergarten and Pre-K kids. This free printable worksheet is a great way to keep kids interested during science lessons, early learning activities or homeschooling activities. Your kids will enjoy playing the words puzzle while learning fun facts about strange undersea creatures. Junior school kids from Grade One to Grade Five can use the strange undersea creatures fun facts worksheet as a reading comprehension exercise. Your kids will learn well about the undersea creatures, because they will most likely end up needing to read more than once the fun facts about strange undersea creatures, to find what the missing words are. The missing word puzzle is a great way for kids to learn and remember facts about strange ocean creatures, while also enhancing their reading comprehension skills. Preschoolers and Kindergarten kids who haven’t yet learned to read and write can enjoy this free printable worksheet for kids as a fun listening comprehension game. Parents can read out loud the fun facts about strange undersea creatures to their kids and then ask the kids to recall what the missing words are. Young kids doing early learning activities, can also have fun playing the hidden words puzzle while practicing to recognize letters and words. Parents doing early learning activities with their kids can use the strange undersea creatures worksheet to awaken their kids in interest in science. Use our free to print out science worksheet to make learning science fun and interesting for your kids. Teachers can use our worksheet all about strange undersea creatures to interest kids during science classes and make learning about strange ocean creatures enjoyable for kids. Private tutors and educators can use our free to download science worksheet for child enrichment programs and extra-curricular science lessons. EasyScienceforKids.com is the best free kids science website with free hidden word search games and free science worksheets to print out. Download our fun free printable science worksheets for kids to make learning science fun! Deep down in the sea, there are many strange undersea creatures. Some look scary and some just look plain weird. Because they live so deep under the sea, they are seldom seen. Some strange undersea creatures are so strange, that it is hard to tell if they are a plant or an animal. Learn fun facts about undersea creatures by downloading this fun free printable science worksheet for kids! [sociallocker]Download this free printable science worksheet about strange undersea creatures. Download our FREE Strange Undersea Creatures Worksheet for Kids! 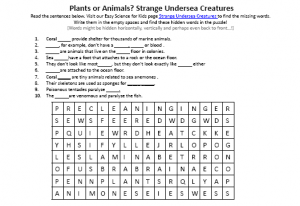 Did you enjoy the FREE Strange Undersea Creatures Worksheet? For more lengthy info, click here. Declan, Tobin. " Strange Undersea Creatures Worksheet - FREE Printable Science Worksheets for Kids to Download - ." Easy Science for Kids, Apr 2019. Web. 24 Apr 2019. < https://easyscienceforkids.com/strange-undersea-creatures-worksheet-free-printable-science-worksheets-for-kids-to-download/ >.